I haven't done one of these in a long time but this band's logo made me want to bring this themed post back from the dead. And you know, what could be more metal than bringing something back from the dead? 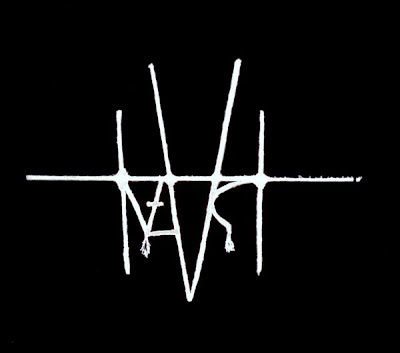 There isn't a lot of creativity in metal logos these days. I might go as far as to say we have hit a wall within this art form in general. Upside crosses, barbed wire, daggers or some kind of weapon, blood or thorn like letting...blah blah blah. Yawn. So, when I see a metal band stepping out from that stereotype, I feel drawn to applaud them, even if their music isn't brilliant. That brings me to the flashcard of the week, an unsigned one man band from Germany who has taken a bold step in the band logo but has softened that wild step apart but also including the must have picture of self in the forest and a picture of drinking beer. Check and check. Kayser - the sole member, I salute you sir for taking your metal art in a most interesting direction. Don't worry, the great music part can come later. Click on the comments section to see the name of the "band" and the link to the site. The name of the band is Inzucht and this is his myspace page.